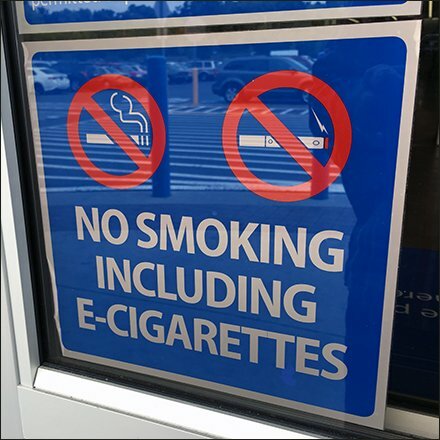 The sign is outside so you do not violate the proposition in-store … no smoking please, including no E-cigatettes or Vapes. The short version of the sign includes “No Smoking” and “No Vaping” symbols. I am not sure the “No Vaping” icon is internationally recognized yet, but a good shot at an icon in the interim. The longer sign message warns of a strict age-check policy for tobacco (and one assumes, vape) purchases in-store.